This dissertation presents a view of clause structure which essentially amounts to denying its existence. Phenomena like adverb placement, short verb movement and verb second, which form core cases in support of contemporary notions of CP-fields and IP-fields in the clause, are better handled in other ways which do not resort to the notion of arbitrary selectional sequences of (functional) syntactic heads. Constraints on the relative ordering with which sentential adverbs can co­occur are treated as a polarity phenomenon. Speaker-oriented adverbs are excluded from monotone decreasing environments, and hence, cannot be outscoped by adverbs like ‘never’. Apart from such requirements, adverb placement is argued to be free. 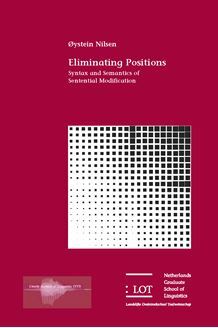 The standard analysis of verb-second in terms of the selectional sequence C,I,V and head-movement of the finite verb to C with subsequent topicalization is shown to run into a series of problems which are taken to show that verb­second does not involve head-movement, and that it should not be characterized in terms of a selectional sequence of heads. The proposed account treats topicalization, verb movement and argument shift as surface reflexes of one movement operation to the first position. This is argued to explain a number of puzzling phenomena, including Holmberg’s Generalization concerning the constraints on “object shift” in Scandinavian. Finally, (short) verb-movement phenomena, as witnessed in Italian, are analyzed as a scrambling phenomenon, driven by stress/focus and scope considerations. This explains the optionality of such verb movement, and removes the need to postulate specific functional heads to attract the verbs.